This is exactly the same high quality print with shipping and handling that reflects international rates. sent in a ridged mailing tube. The price per print is $33.95 -- plus shipping and handling. Add a second print for $25.50. To purchase prints or calculate shipping, click on the "Buy Now" link below. 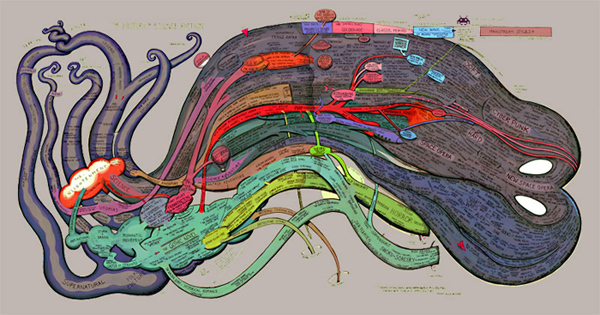 "History of Science Fiction" is a graphic chronology that maps the literary genre from its nascent roots in mythology and fantastic stories to the somewhat calcified post-Star Wars space opera epics of today. The movement of years is from left to right, tracing the figure of a tentacled beast, derived from H.G. Wells' War of the Worlds Martians. Science Fiction is seen as the offspring of the collision of the Enlightenment (providing science) and Romanticism, which birthed gothic fiction, source of not only SciFi, but crime novels, horror, westerns, and fantasy (all of which can be seen exiting through wormholes to their own diagrams, elsewhere). Science fiction progressed through a number of distinct periods, which are charted, citing hundreds of the most important works and authors. Film and television are covered as well.